Hello crafty friends! Amy here today to share a card I made with A Bird's Life stamp set. This set is so "tweet"! I just love the adorable birds and their houses. I stamped the images from A Bird's Life on smooth white cardstock, and colored them in with Copic markers. I then cut them out with their coordinating dies. These images are perfect for creating little scenes, so I used a frame that allowed me to do that. Don't they look so cute inside the four rectangles? 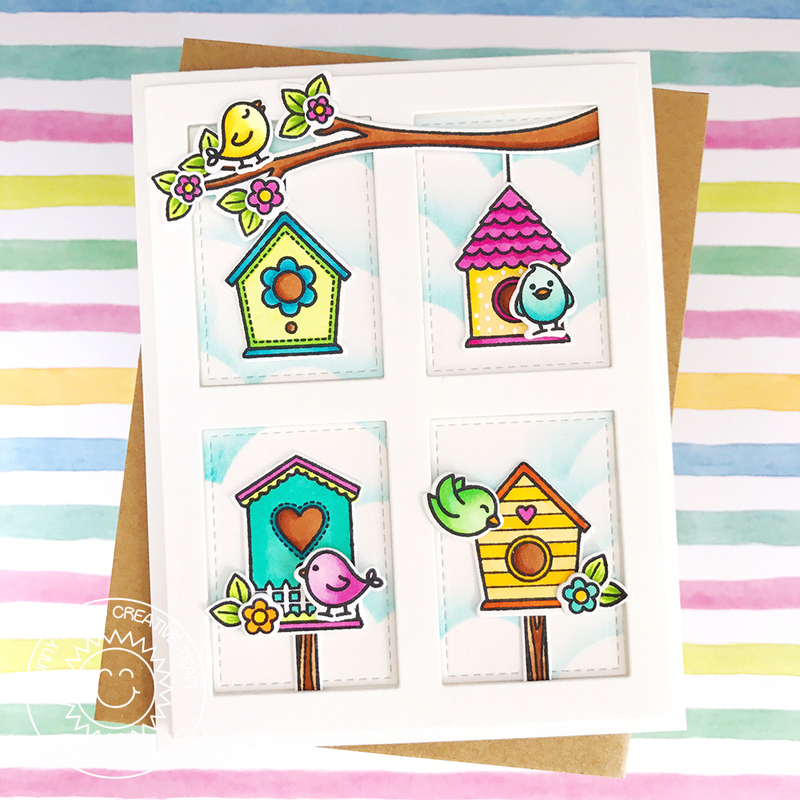 I stamped the sentiment on the inside of the card, and also added a bird and a birdhouse. I hope you like today's card. Thanks for visiting the blog, and have a great day! Hello friends! Amy here today with a Designer Series card featuring the new and fabulous Celebration Balloons stamp set and Framed Tags Chelsea Creative Cuts. I made a shaker card for my son, who will be graduating from elementary school in a couple of weeks. 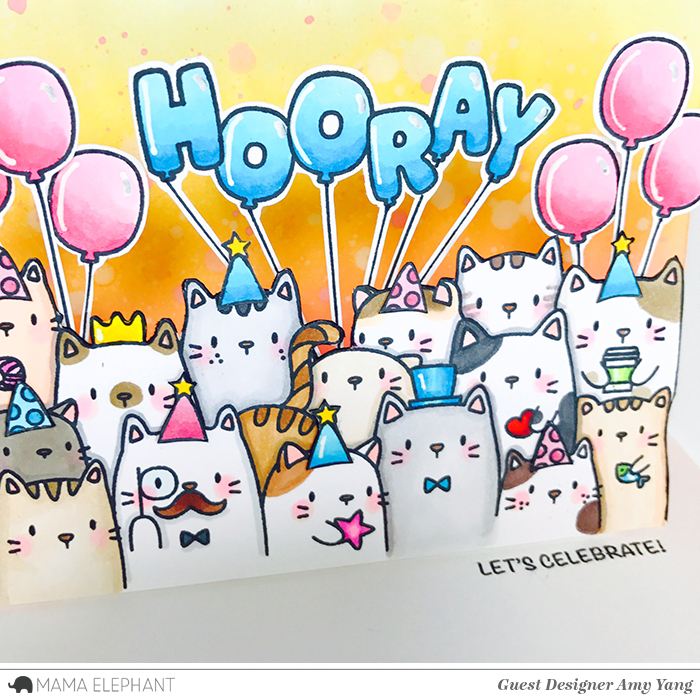 I stamped the "Congrats" balloon from Celebration Balloons, the cat and the accessories from Page Huggers on smooth white cardstock. I colored the images with Copic markers and cut them out with the coordinating dies. For the sign the cat is holding, I used stamps from Congrats All Around. Included in the set is a chick holding a sign. I removed the chick by masking, stamped the rectangle, added the sentiment "super duper proud of you" and colored it with Copic markers. To make the background, I blended the panel with Peacock Feathers, Cracked Pistachio and Fossilized Amber Distress Inks. For the shaker window, I used trimmed acetate and framed it with cardstock that was die-cut with the frame die from Framed Tags Chelsea Creative Cuts. Please note, I removed the inside part of the frame where you see the perforated line with the paper trimmer. It was very easy to do. I used two layers of dimensional tape to adhere the shaker window to the background panel. Inside the shaker, I added iridescent and clear stars from Pretty Pink Posh. To finish, I attached silver strings behind the balloon and adhered all the images to the front. 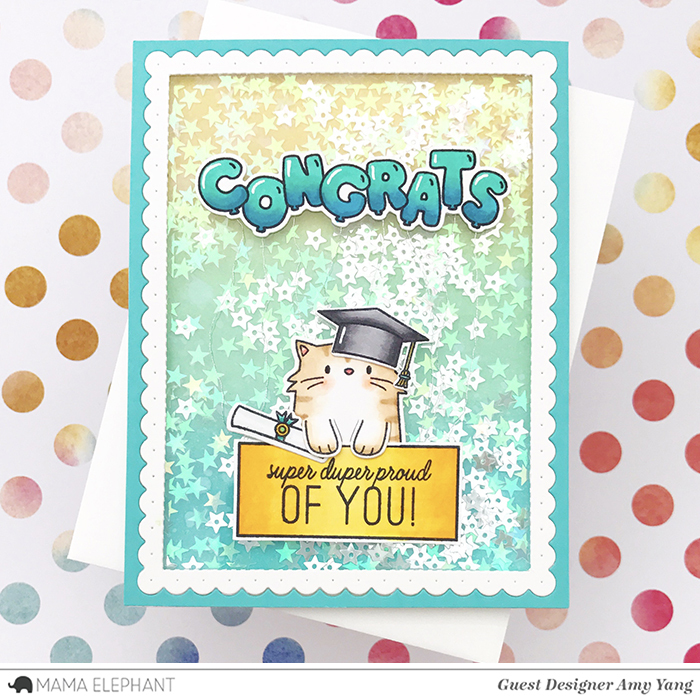 I can't wait to give this card to my son on his graduation day; I know he's going to love this fun shaker card with a cat that'll remind him of his favorite stuffed animal that he's had since he was a baby. Thank you for stopping by the blog today. I hope you have an amazing day! Ahoy mateys! Amy here to share a masculine card using the new Pirate Pals stamp set and its coordinating dies. To create the background, I used a star die to die-cut white cardstock, and used the negative as the backdrop of the card. I also used the Stitched Scallop dies to add waves to the background as well. I distressed all the cut pieces with Distress Inks, and added white splatters and lines to the card. I thought it'd be fun to have a moon in the scene, so I used a circle die from Sun Ray Dies to die cut white cardstock. After, I adhered all the background pieces to a folded note card and framed it with an A2 size white cardstock that has been die-cut with an oval die. To create the beachfront, I die-cut white cardstock using the wavy die from the Oceans Of Joy dies set. I distressed it with Distress Inks, and added splatters of ink and water for a textured look. 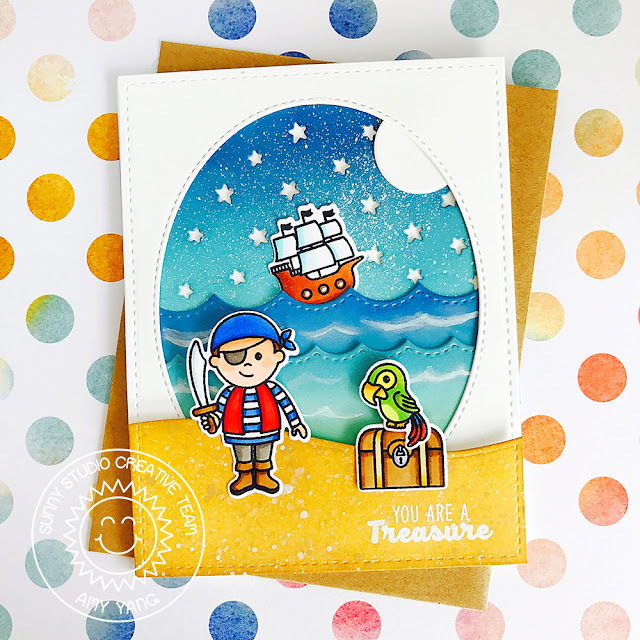 I stamped the sentiment "You Are A Treasure" from Pirate Pals with Versamark, and heat embossed it with white embossing powder. 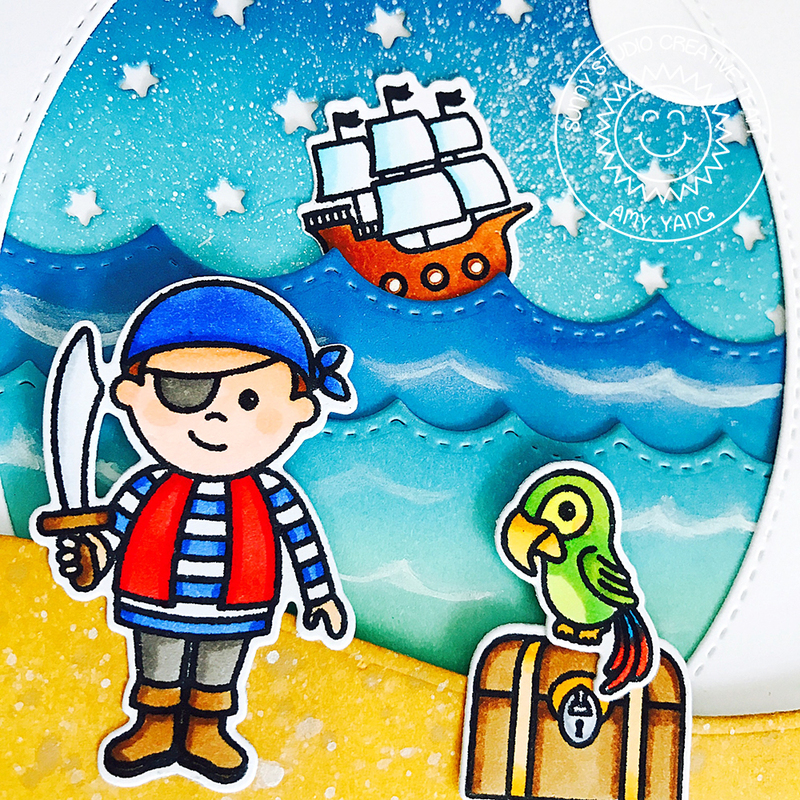 I stamped images on this card from Pirate Pals, colored them in with Copic markers, and cut them out with coordinating dies. To finish, I adhered all the images to the card front. I hope you enjoyed today's post. Thank you for stopping by the blog today! Hello friends! Today, Mama Elephant is highlighting the wonderful Celebration Balloons set and matching coordinating Creative Cuts. I have two baby cards to share with you. 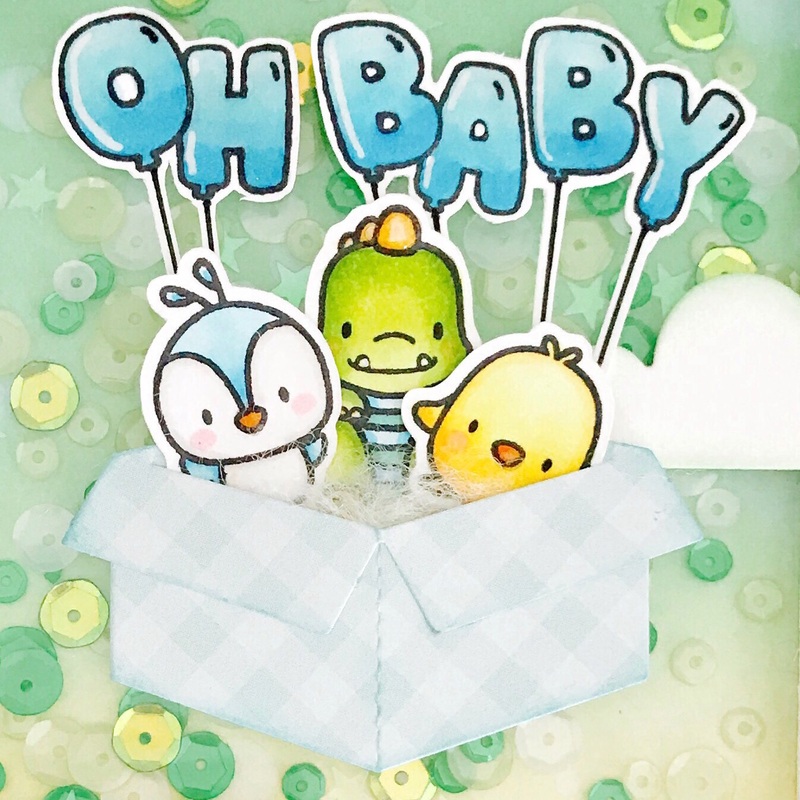 For both cards, I stamped the sentiment "Oh Baby" (I drew in the strings with Momento black marker) from Celebration Balloons and the adorable baby critters from Just Hatched. I colored them in with Copic markers and cut them out. I added white highlights to the balloons using white Gelly Roll pen. After, I used Glossy Accents on the balloons as well as the critter's nose and the dinosaur's plated back. I thought the critters would be cute in a box, so I die-cut pattern paper using the box die from All Prettied Up Creative Cuts set. I lightly distressed the box edges with Distress Inks. Before placing the critters in the box, I added some white felting wool. I wanted to put them in something soft. I framed both cards with white cardstock that has been die-cut with a scalloped frame die from Frame Tags Madison Avenue Creative Cuts set. For the girl's card, I used the edges of an acetate that I die-cut using a cloud die from Landscape Trio Creative Cuts to create the clouds for the background. I applied Cracked Pistachios Distress Oxide ink. I added a layer of polka-dot vellum paper on top. Then, I framed the card (the frame has 5 layers adhered together for dimension) and added a cloud to the bottom of the card front that I die-cut with the cloud border die from Landscape Trio Creative Cuts. Lastly, I adhered some pretty iridescent stars and sequins from Pretty Pink Posh. For the background of the boy's shaker card, I distressed it with Fossilized Amber and Cracked Pistachios Distress Oxide inks. I love using the Oxides because they blend so easily. I added the small clouds ( I lightly distressed the edges) to the card front that I die-cut with Rainbow High Creative Cuts. For the shaker component, I used sequins from Pretty Pink Posh. Don't you just love those balloons? I sure do; I love replacing the sentiments with them. I think they're super cute and fun!!! Thank you for stopping by today. Don't forget to visit the Mama Elephant Blog for more inspiration using the Celebration Balloons set! Hello! I hope you had a wonderful weekend. Today, Mama Elephant is highlighting the super duper cute stamp set, The Cat's Meow. I love how this set gives you one large crowd of cats (yeah, no need for masking!) with some single cats and accessories. It's a fun and unique set for any cat lovers or animal lovers in general. 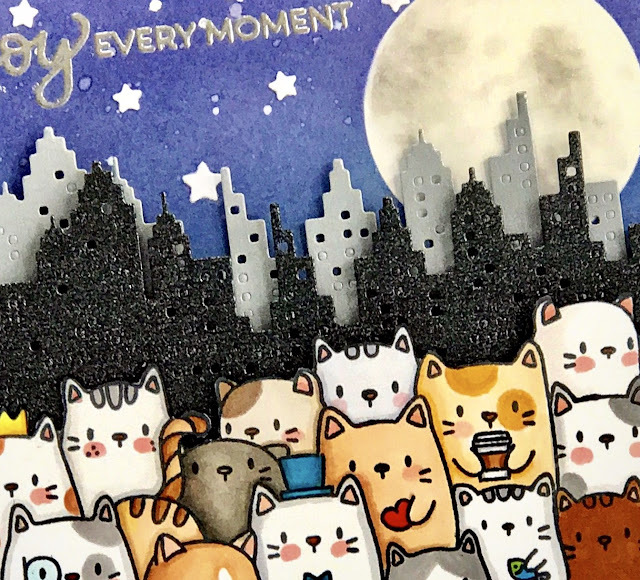 For today's card, I wanted to create a night scene with the cats hanging out in the city, enjoying their time together. I started the card by die-cutting masking paper with the second largest circle die from Sew Fancy Creative Cuts to create the moon. After adhering the masking paper to trimmed Bristol cardstock, I inked the background using various shades of blue Distress Inks. Then, I added small water splatters for a textured look. Once the background dried, I stamped the sentiment "Enjoy Every Moment" with Versamark Ink and heat embossed the silver embossing powder. Then, I added some warm gray Copic markers to the moon and blended it out, hoping for the best. I also added some stars to the background that was made by die-cutting white cardstock with Lots Of Stars Creative Cuts. You can't see it on the picture, but I applied Wink of Stella to the moon and the stars for shine. To add more interest to the card, I added 2 layers of the skyline in different colors that was die-cut with the Cityscape Creative Cuts. For the image, I stamped the crowd of cats and colored them in with Copic markers. I fussy cut them out and added foam tape behind them for added dimension, and adhered to the front of the skyline to complete my card. I hope you like today's card, I had so much fun making it. 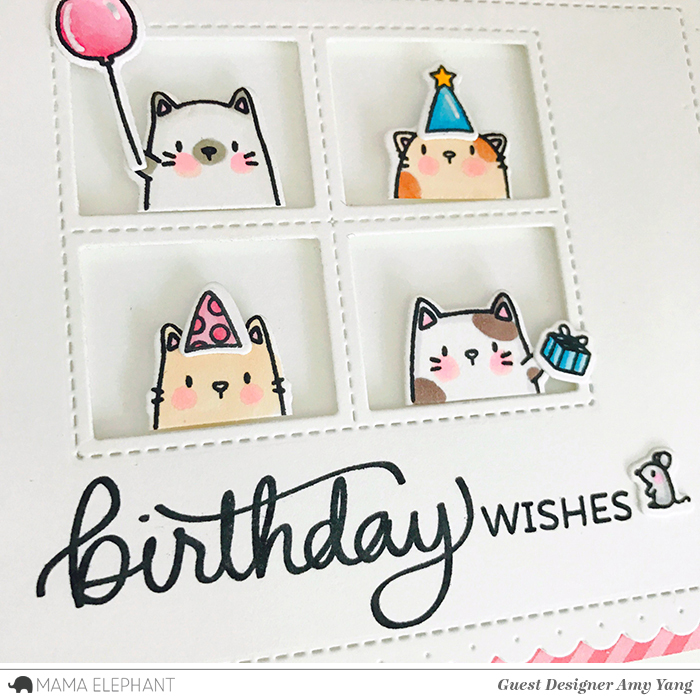 Don't forget to stop by the Mama Elephant Blog for more inspiration using the The Cat's Meow stamp set. Pretty Pink Posh: Friends Forever. Hello there! 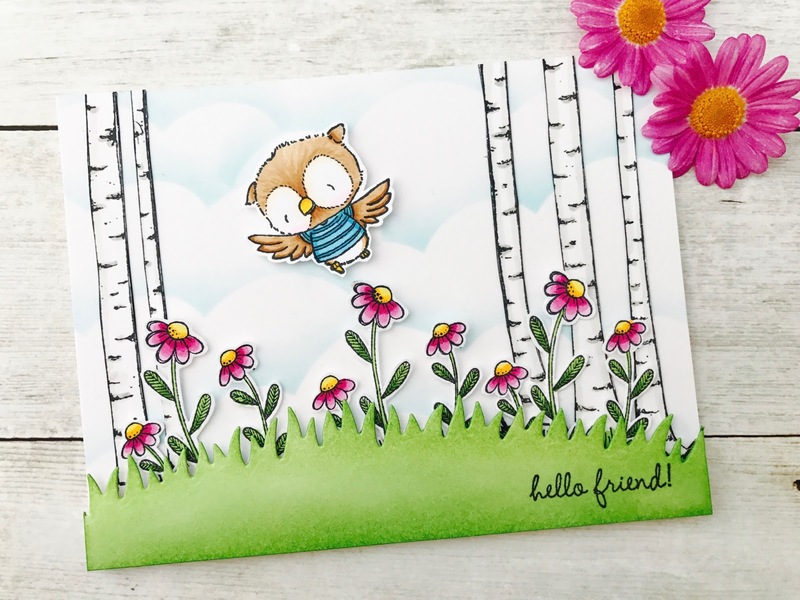 I'm back again to share a friendship card that features one of the cutest critter stamp set, Woodland Critters from Pretty Pink Posh. This set sold out quickly, but it's now back in stock along with the other sold out May release. I started the card by creating a A7 size card front with trimmed Bristol cardstock. I distressed the card with various Distress Inks, adding clouds with a die-cut acetate that I made using one of the cloud-like borders from Stitched Borders 2. Then, I used the Storybook 1 die and die-cut the card front twice as shown in the picture. 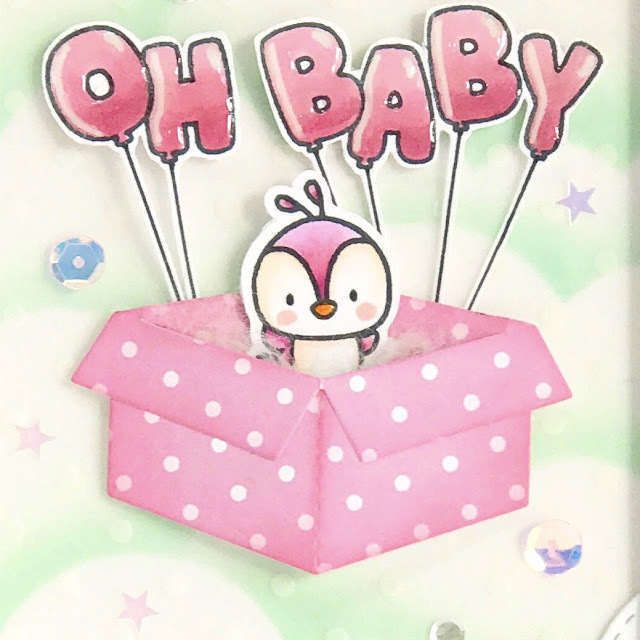 This card could actually be made into two cards if I used an A2 size card front and die cut the frame just once. But for this card, I wanted to create a storybook like scene with more critters, so I made a bigger card. Hope that makes sense. After, I added foam tape around the frame and adhered it to the folded note-card. Then, I took one of the negative die-cuts and stamped the sentiment "Friends Forever" from Woodland Critters. Afterwards, I adhered all the negative die cuts back into their places. Most of the images are from the Woodland Critters set except for the tree branch. I borrowed that from the Birdie Friends set. The stamped images were colored in with Copic markers. Please note: I mirrored stamped the bird so that it could face in the direction of all the critters. 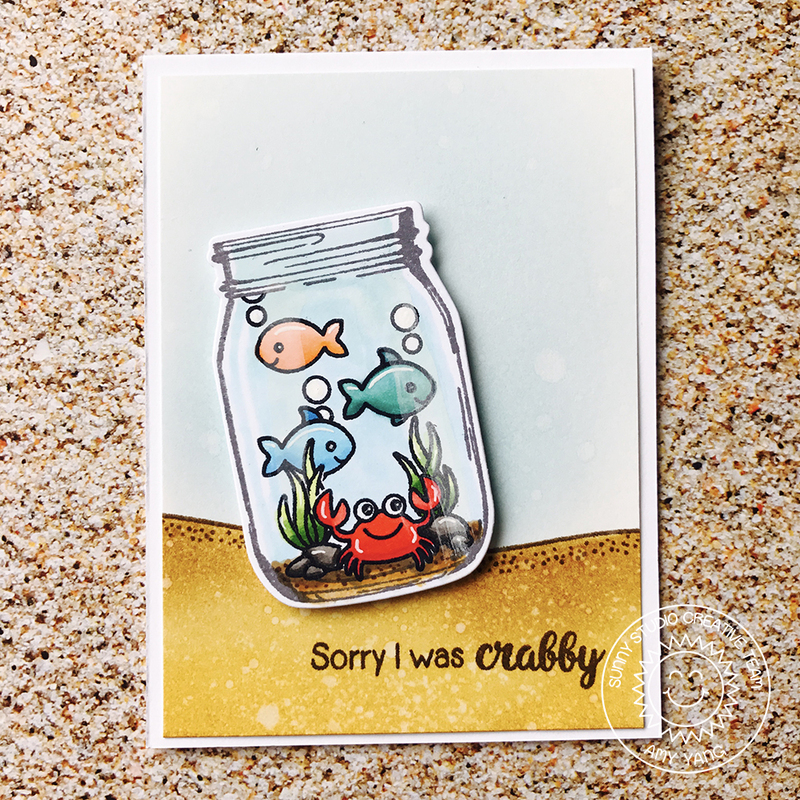 I think this card turned out really cute (how can it not with all the adorable critters, right?). I hope you like it! Sketch Challenge #333. I love combining them together whenever I can. It pushes me to think outside the box and try things that I normally wouldn't. Here's the color and the sketch challenge. I used a super cute MFT, Up In The Air stamp set. Colored them in with Copic markers. I inked the background with Distress Oxide inks, using colors that fit the challange. 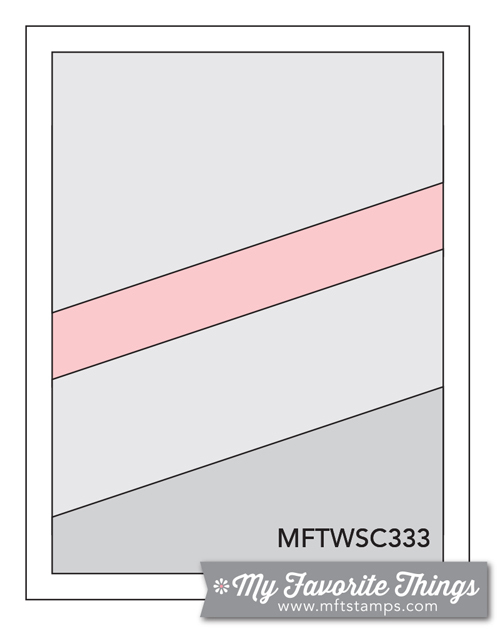 The Sketch challenge has two diagonal lines. So for the first diagonal line, I used cardstock that was die-cut with a cloud border die. For the second diagonal line, I combined two banners that are included in the stamp set and added a die-cut heart to cover up where I attached them. 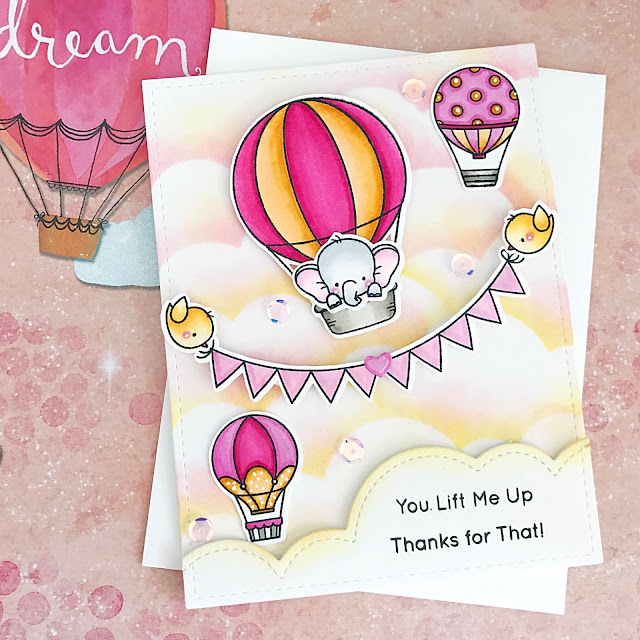 I finished off the card with my favorite 6mm Ballerina Pink sequins from Pretty Pink Posh and some Wink Of Stella on the hot air balloons and banners. I hope you enjoyed today's post. Thank you for stopping by. Have a wonderful weekend! Hello crafty friends! 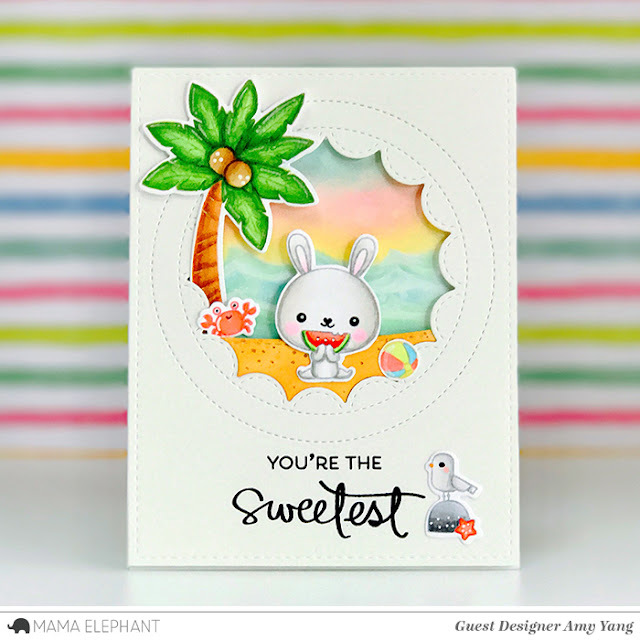 Today, Mama Elephant is highlighting the Sweetest Greetings stamp set. It contains 11 sentiments that can be used for variety of occasions. I love the whimsical look of the handwritten sentiments combined with smaller fonts that is simple yet fun; a definite must have in my book! I have two cards to share with you. In addition to the Sweetest Greetings, I used the Summer Days (another fabulous new release item) to create my scenes. The designs of the cards are the same, but colored differently. I wonder which one you'll prefer. For the first card, I was going for a sweet and soft look. To achieve this, I stamped the images from Summer Days, using Memento Desert Sand ink on some and London Fog ink on the others . I colored them in with Copic markers. To create the beach, I die-cut a trimmed paper with one of the hillside borders from Landscape Trio Creative Cuts, and distressed it with Distress Oxide and added some ink splatters. I then distressed the background with various Distress Oxides to give it a sunset sky look. To add texture to the water, I experimented by drawing wavy lines with a white Gelly Roll pen and smearing it using my finger to give it a softer look. To frame the images and the background, I die-cut cardstock with the big frame from Peek A frame Creative Cuts and the dashed circle from Framed Tag Columbus Circle Creative Cuts. I stamped the sentiment "You're The Sweetest" from Sweetest Greetings (it's one long sentiment but I cut the stamp so that I can split them up) before adhering the frame to the distressed panel. I thought the sentiment was perfect for both cards, because the bear and the bunny are both eating something sweet. For the second card, I wanted the theme to be bright and happy. I stamped the images with Memento black ink and colored them in with Copic markers. I also colored the beach and the backgrounds with Copic markers. I did the same thing to the water by adding Gelly roll pen; and everything else is the same the first card. Thanks for stopping by the blog today! Don't forget to visit the Mama Elephant Blog for more inspiration from their super talented designers. 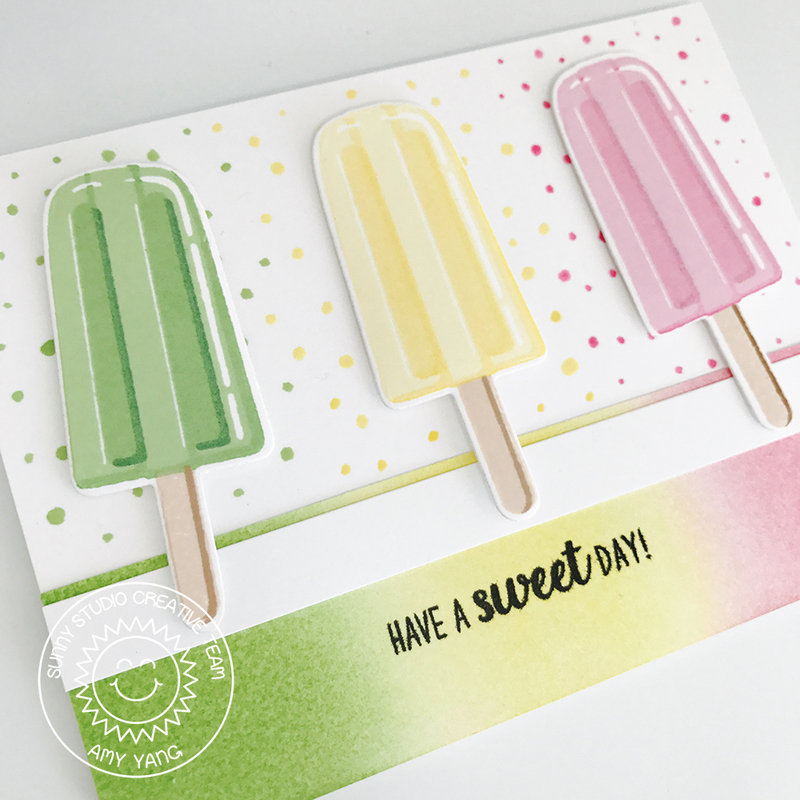 Sunny Studio Stamps: Have A Sweet Day! Hello crafty friends! I'm here to share with you a colorful and summery card using the Perfect Popsicles stamp set from Sunny Studio Stamps. 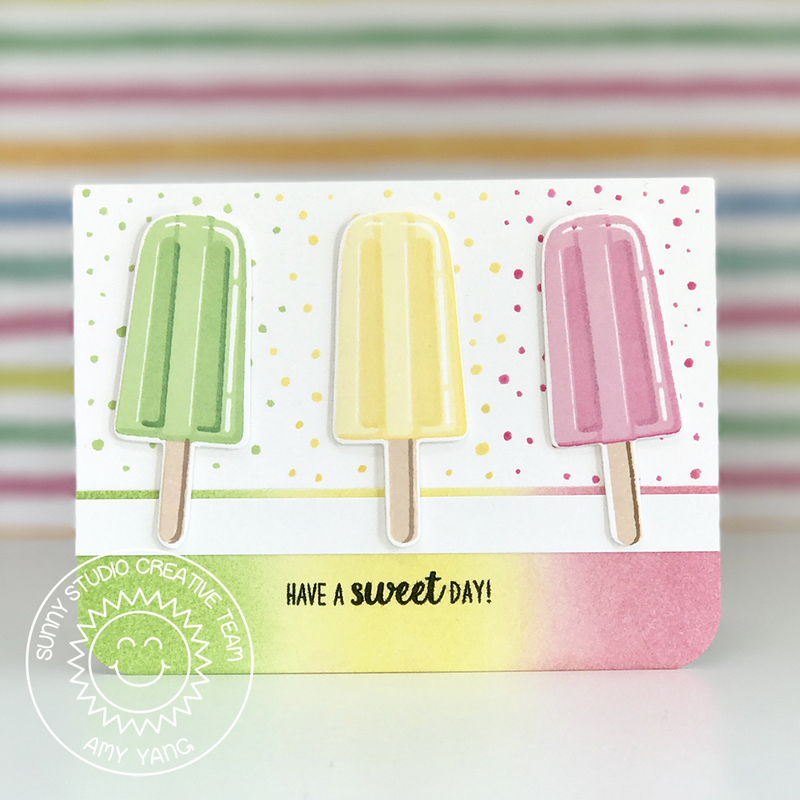 I used one of my favorite bright color combination to stamp the Perfect Popsicles using dye inks and cut them out with coordinating dies. Don't they look good enough to eat? Mendi did such an amazing job creating these layering stamps to give it realistic 3D look. Using the same dye inks, I stamped the ink pad on acetate and added some water to dilute it. I used a paintbrush to pick up the colors, and added random dots to the card front. 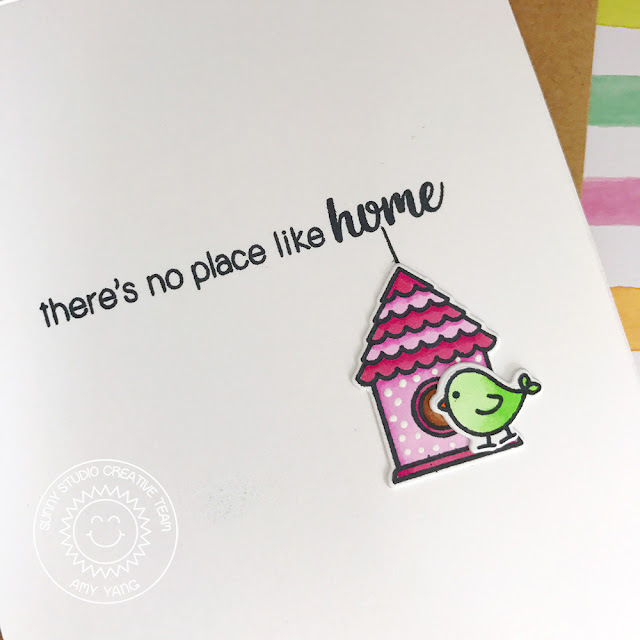 Then, I used prepared trimmed Bristol cardstock to blend the same colors with a blending tool and added a sentiment from Perfect Popsicles. I adhered blended paper to the card front, and added a strip of white paper as shown. To finish, I popped up the Popsicle with foam tape for dimension and mounted the card front to the top folding card base. Thanks for stopping by, see you again next Wednesday! Hello friends! 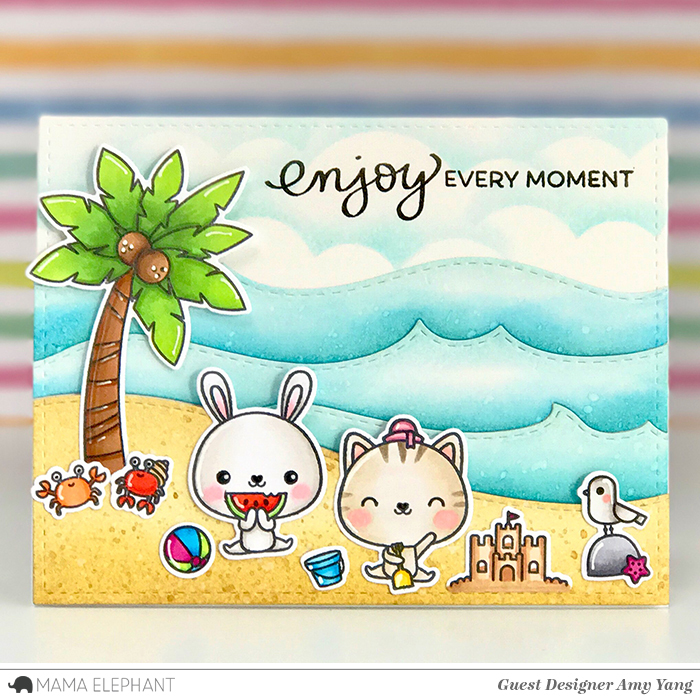 Today Mama Elephant's design team and I are showcasing the May release, Summer Days stamp set with its coordinating Creative Cuts. 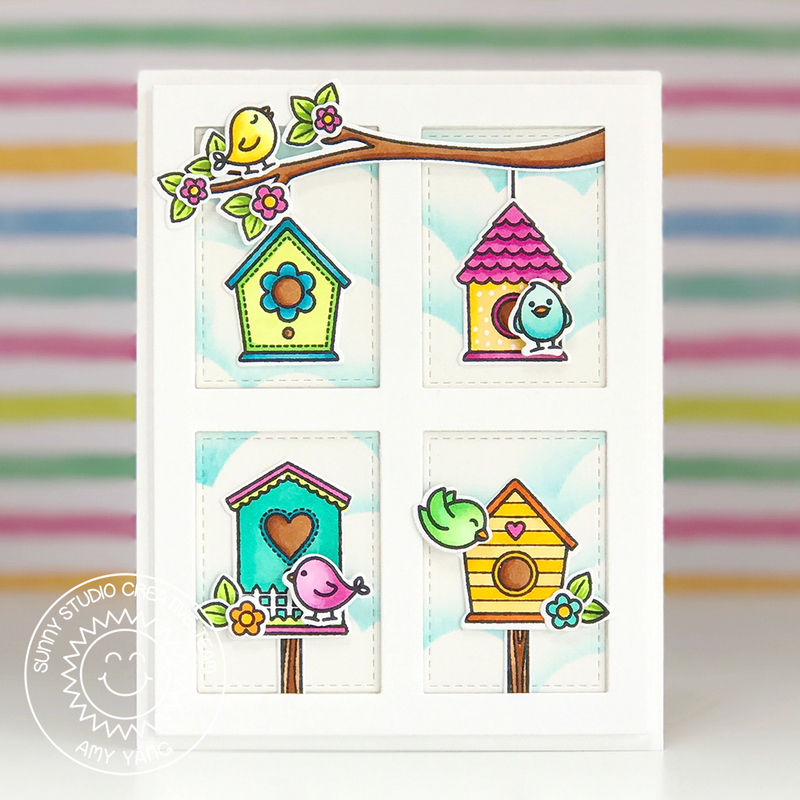 I love this stamp set, I think it's great for creating really cute and delightful summery cards. I started by die-cutting three Bristol cardstock with the frame die from the Peek A Frame Creative Cuts. With the first cardstock, I stenciled in the clouds using an acetate that I die-cut with a cloud border from Landscape Trio creative cuts. At this point, I stamped the sentiment "Enjoy Every Moment" from the Sweetest Greetings. Then, I took the second cardstock and die-cut it using Ocean Waves Trio creative cuts. The last cardstock was die-cut with one of the wavy borders from the Landscape Trio creative cuts. All the them were inked with Distress Inks using a blending tool. I also added ink and water splatters to add interest and texture to the card. 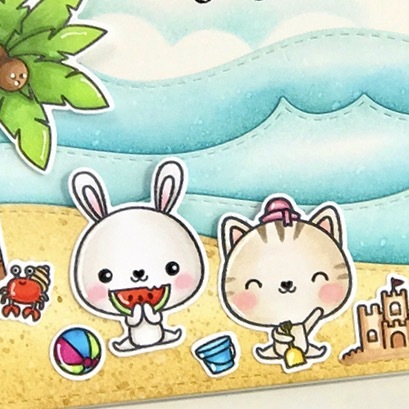 For the images, I stamped the adorable critters and the accessories from Summer Days and colored them in with Copic Markers. Then, I die-cut them using the coordinating creative cuts. Lastly, I added some white highlights to the images using the white Uni-ball Signo pen. Thank you for stopping by today! 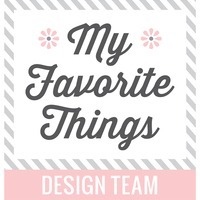 Don't forget to head over to the Mama Elephant Blog to see other fabulous projects by the design team. Hello sweet crafty friends! For the stampede I have a fun pop-up card that features many of the new and fabulous products from Mama Elephant. 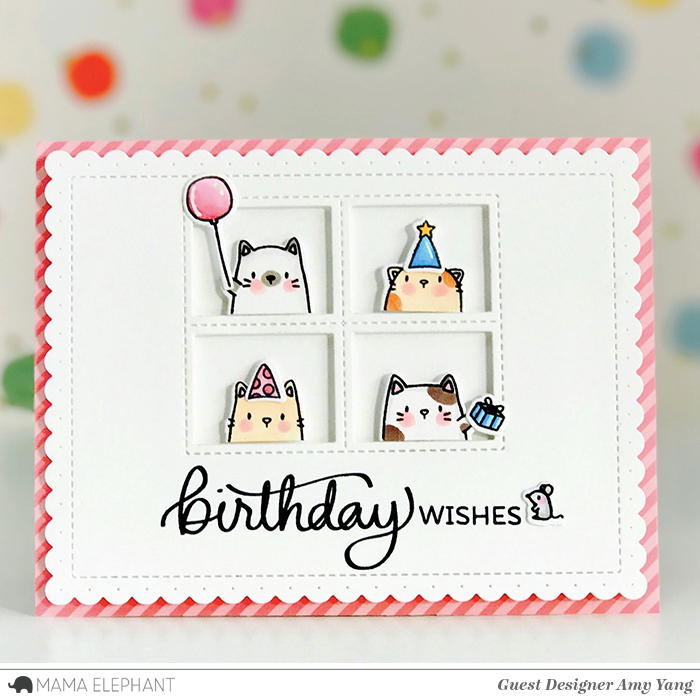 I used the Sweetest Greetings, Celebration Balloons, The Cats Meow stamp sets and the Framed Tags Chelsea Creative Cuts. For the card front, I die-cut white cardstock with the large frame and the window frame from Framed Tags Chelsea Creative Cuts and stamped a sentiment "birthday WISHES" from the Sweetest Greetings set. For the images, I used the adorable single cats and their accessories from the The Cats Meow. I colored them with Copic Markers and die-cut using coordinating creative cuts. For the inside of the card, I distressed the background using Distress Inks and added some ink and water splatters. For the images, I used the crowds of cats (trimmed off a few) stamp and the party hats from The Cats Meow along with the balloons from Celebration Balloons. I stamped and colored them with Copic Markers. I made my own pop up to hold the images but you can use Pop Up Creative Cuts too. 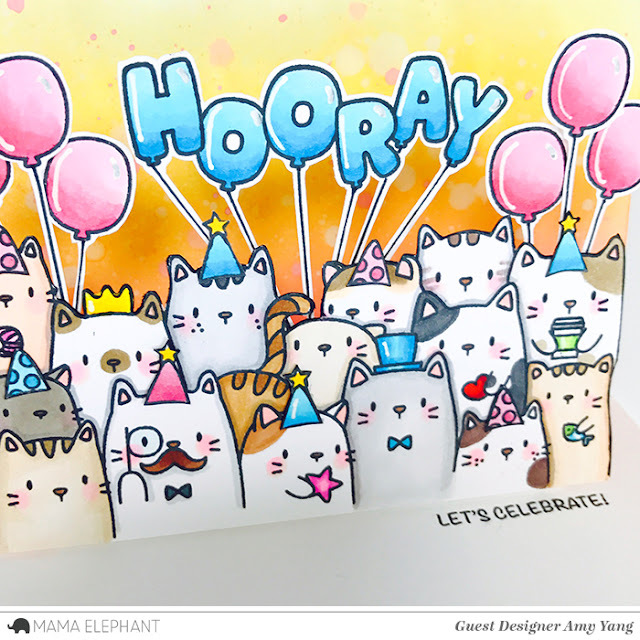 I stamped the sentiment "Let's Celebrate" that coordinates with the "Hooray" balloons on the inside of the card as shown. Thank you for stopping by my blog today! Have a great day! 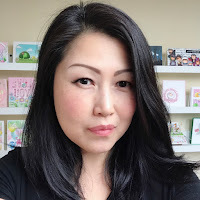 and joining us again is our fab guest designer Amy Yang! 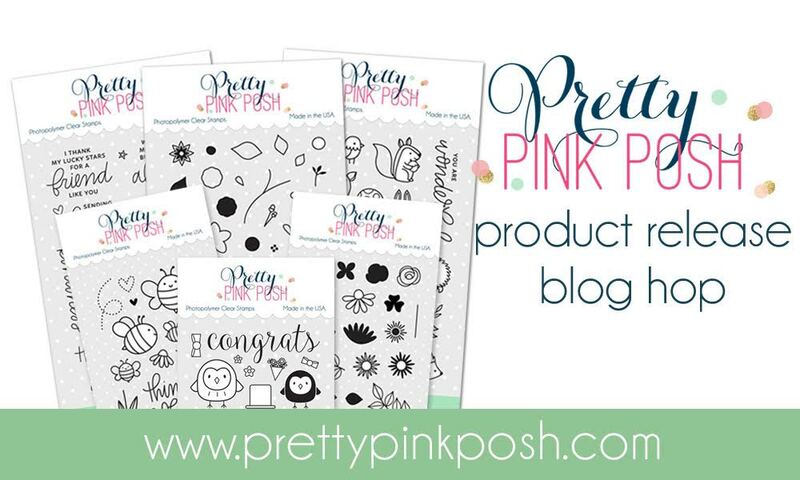 Welcome to the second day of the Pretty Pink Posh May 2017 Product Release Blog Hop! If you've hopped here from Jessica Frost- Ballas's blog, you are in the right place. First up is this sweet shaker card I made using the new Woodland Critters and Bold Blooms stamp sets. I stamped the images on watercolor paper and colored it with Distress markers. For the shaker component, I used the new Sparkling Clear Flowers sequins. It looks so pretty inside the shaker card. I distressed the card front with Distress ink with Spun Sugar. I heat embossed the sentiment from the Woodland Critters set. Before moving on I added some Sparkling Clear Flowers sequins to the card front as well. I adhered the die-cut Scallop Ovals on the top of the acetate shaker window. I glued 5 layers of the ovals together so that it could frame the bear and the butterfly that was mounted with foam tape. In doing so, it added really nice dimension to the card. Next, I adhered the flowers and the leaves from the Bold Blooms between the two scallop ovals. Don't you think the two different sized ovals look pretty together? I think it adds a lot of interest to the card. 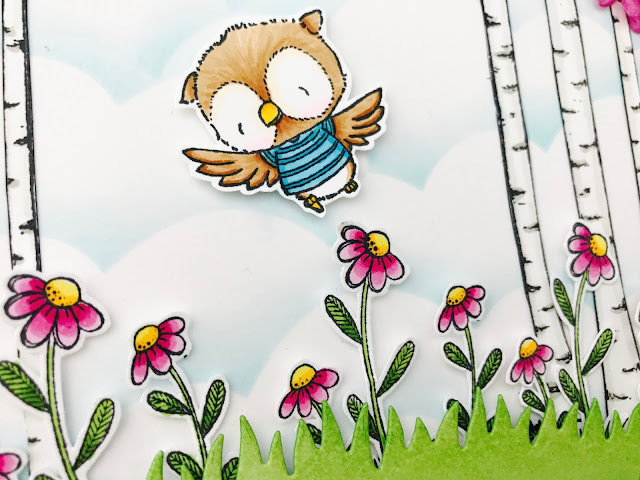 My next project is another sweet shaker card using the new Happy Owls, Build A Bloom, and the Bold Blooms stamp sets. I stamped the adorable owls and their accessories and colored them with Copic markers. For the flowers and the leaves I stamped them with various dye inks and added some accents with white Gelly Roll pen. Next, I die-cut the card front using the Stitched Notes. Then, I blended the background using dye inks. For the shaker component, I used Daffodil Beads. I perched the owls on the windows from the die-cut Stitched Duo 3 frame. I then arranged and adhered the flowers and the leaves to the card. To finish, I added the stamped and cut sentiment "Congrats" from the Happy Owls set . Thanks so much for stopping by my blog. Next up is Joni Andaya. Enjoy the hop and have a great day! Be sure to leave a comment on each stop! There are 4 $25 gift certificates up for grabs, two winners each day! Winners will be picked randomly along the blog hop. Comments must be left by 11:59 PM PST on 5/17/2017. Winners will be announced on the PPP blog. Hello everyone! 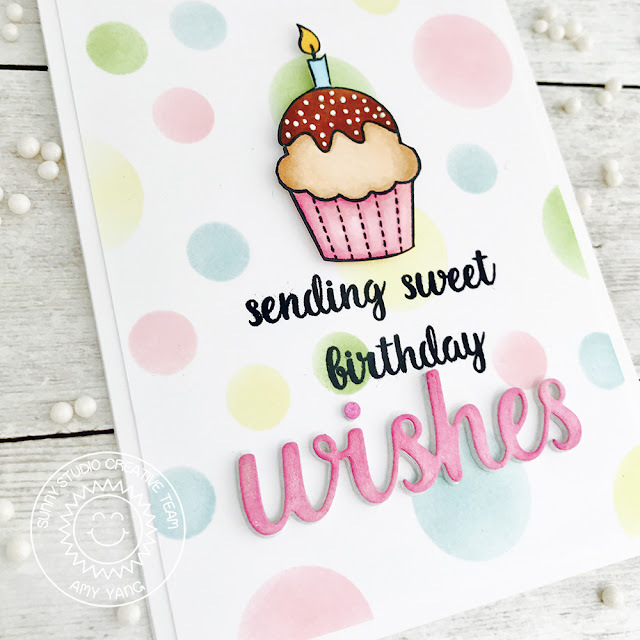 I'm here to share with you a birthday card featuring the Heartfelt Wishes stamp set with the coordinating Wishes Word Die. To begin my card, I used a circle stencil I made by die-cutting acetate with two smaller circle dies from the Sun Ray set. I used pastel dye inks to color in the circles with a sponge dauber on smooth white cardstock. Then, I stamped the sentiment from Heartfelt Wishes to the panel using black ink. Next, I die-cut the word "wishes" using the Wishes Word Die five times on white cardstock and adhered them together. I used darker pink dye ink to color the word with a sponge dauber and adhered it to the panel. 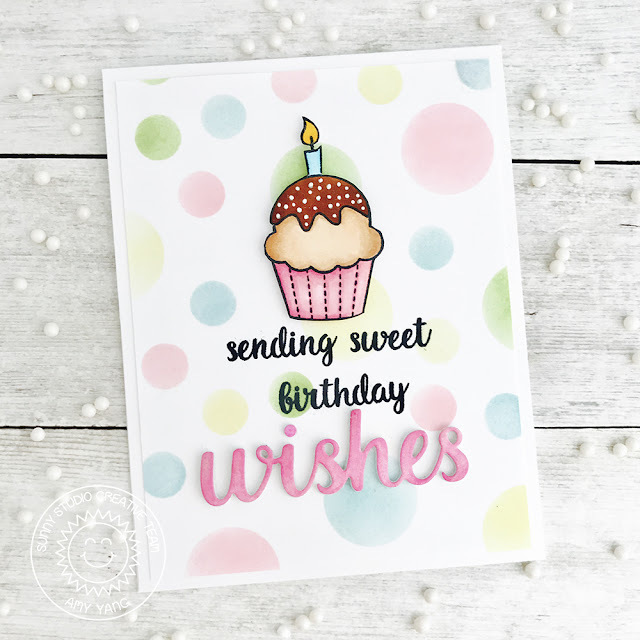 I stamped the cupcake with a candle from the Birthday Smiles stamp set and colored it with Copic markers. To finish, I fussy cut the image, added dimensional adhesive behind it, and adhered it to the front. Thanks for visiting the blog today and have an awesome day! Purple Onion Designs: Hello Friend! Hello friends! Today I'm sharing a friendship card I made using rubber stamps from Purple Onion Designs, illustrated by Stacey Yacula. I used an adorable flying owl name Ruby and surrounded him with Birch Trees and Daisies. I stamped and colored the images with copic markers and fussy cut them out. I created the background using a cloud stencil I have with Tumbled Glass Distressink. I also die-cut white cardstock using a grass die and distressed it with Mowed Lawn Distress Ink. Then, I stamped the sentiment "hello friend" from Sweet Summer Sentiment Set. To assemble the card, I adhered the Birch Trees with glue to the cloud panel. Then, I added the Daisies with double sided tape. When I fussy cut the Daisies they curled up a little. I thought they looked cute that way (they also added a nice dimension) I only taped down the bottom to the cloud panal. For the grass, I added foam adhesive and adhered that to the front of the flowers for more dimension. To finish, I popped up Ruby with foam adhesive as well. Hello crafty friends! 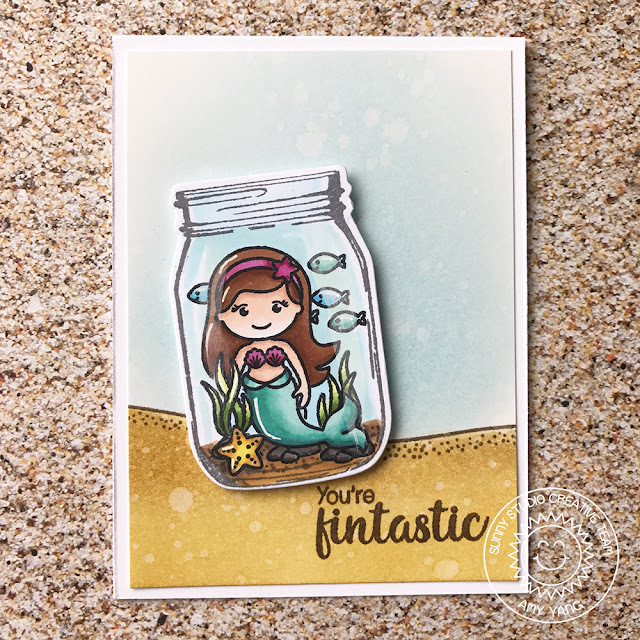 I'm here to share with you a fun trio of cards that features Oceans of Joy and Magical Mermaids from Sunny Studio Stamps. 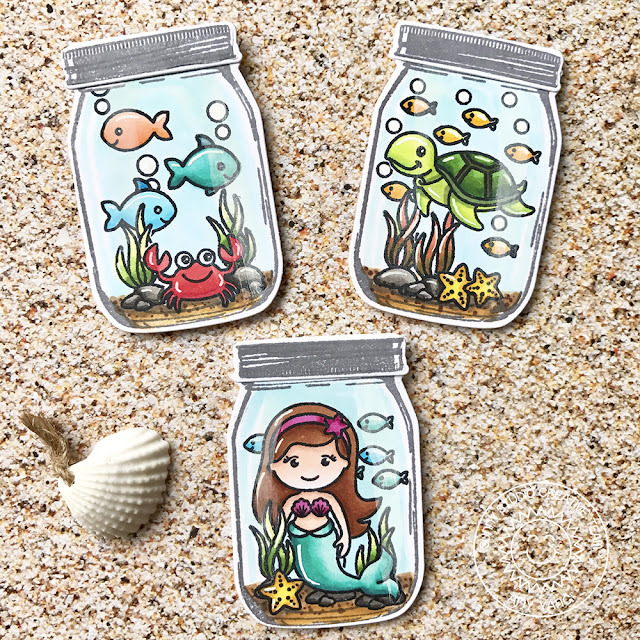 These two stamp sets compliment each other perfectly to help you create wonderful underwater scenes. The fun aspect in my cards comes from the fact that I put some adorable sea animals inside a jar using the Vintage Jar set. Let's take a look. To create the scenes in the jar, I used a masking technique so that I could make some of the images look like some are in the front, and others are in the back. Once I had everything stamped on smooth white cardstock, I colored them in with Copic markers. I added some diluted white acrylic paint with my finger going down the jar in an attempt to make it look glassy. I then die-cut the jars and lids with their coordinating dies. 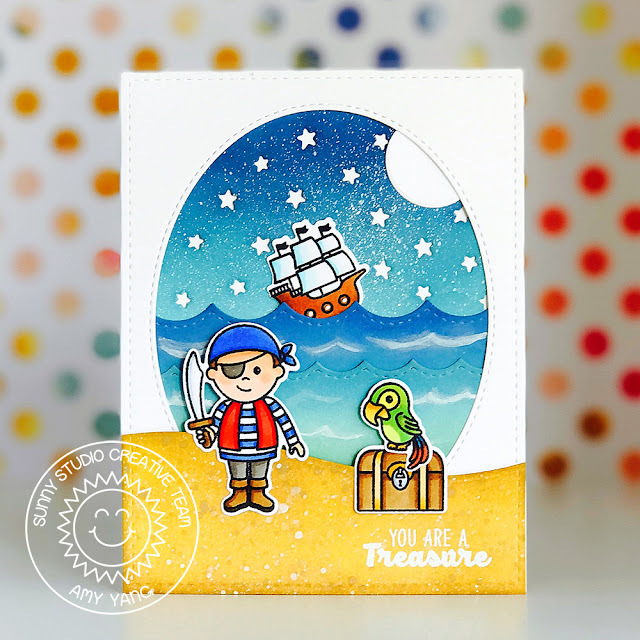 To create the background panel, I used prepared bristol cardstock that measured 3.25" x 4.5" and stamped the sandy border from Oceans of Joy using Versafine Vintage Sepia ink. I distressed the background with Tumbled Glass, Brushed Corduroy, and Mustard Seed Distress Inks and added splatters of water. Once it dried, I stamped punny sentiments to each card. 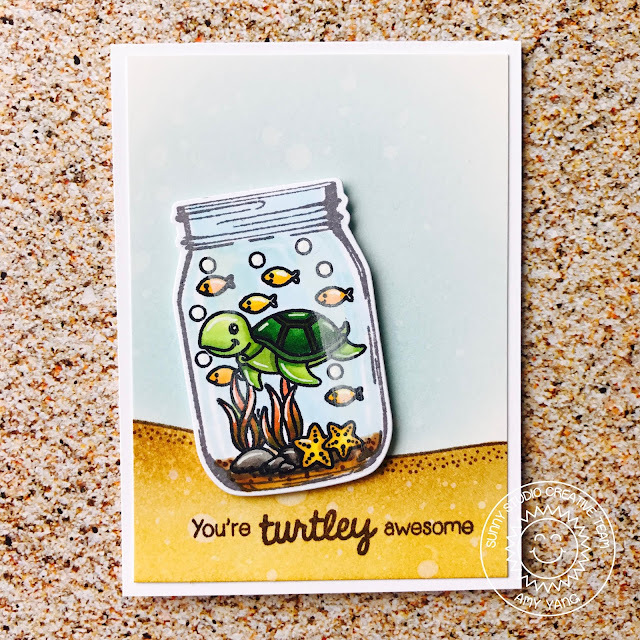 For the "You're turtley awesome" sentiment, I used stamps from Turtley Awesome. I hope you enjoyed the cards. Thanks for visiting the blog today!